Charter a private jet from New York to West Palm Beach with Private Jets Teterboro, the #1 source for aircraft rentals in New York City, NY. Enjoy the best deals on private flights with 24/7 on-demand charter services at Teterboro Airport (TEB) and other private airports in New York. 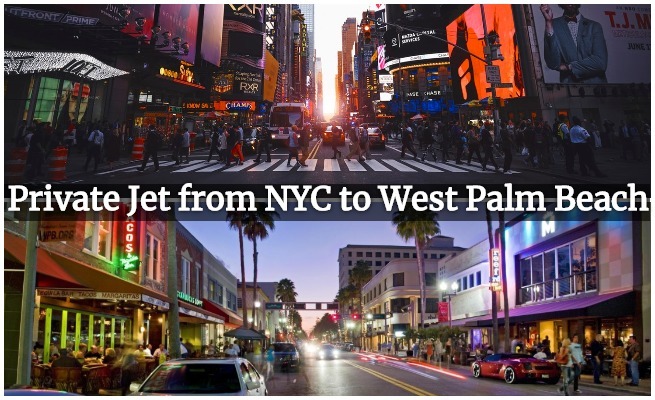 Our team of aviation specialists will connect you to a fleet of more than 10,000 charter planes for flights between New York and West Palm Beach, one of the country’s most popular business jet routes. In addition to arranging private jets to Palm Beach international (PBI), our team can also arrange private jet charters to/from Boca Raton, Palm Beach Gardens, Port St. Lucie, Fort Pierce, Stuart, Jupiter, and more. We enjoy instant access to charter planes along the entire Atlantic Coast, no matter where you’re located. We’ll compare rates from every available operator that meets our safety standards so you get the best deal on your charter flight. This includes transient jets returning to their home airports in New York and South Florida, which can save you thousands on your charter costs with an empty leg flight. Once your flight is booked, we can tailor your experience with luxury concierge services, from in-custom flight catering and luxury ground transportation awaiting your arrival, to helicopter and yacht charters in both South Florida and Manhattan. 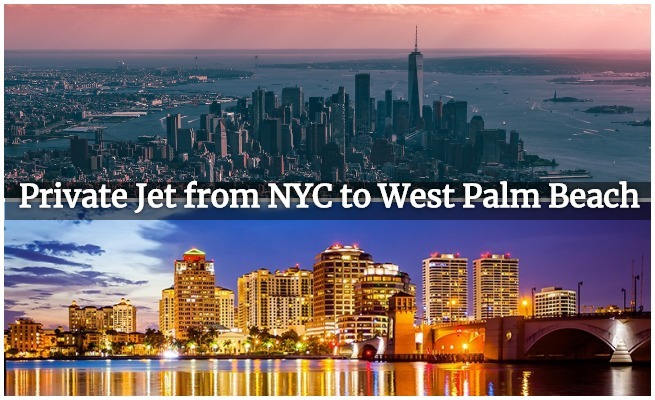 Looking for a private flight from West Palm Beach to New York? We have incredible private jet deals for clients returning to New York. For pricing and availability on private jet charters to/from West Palm Beach, or for more information on aircraft rentals in NYC, e-mail us or give us a call at (888) 987-5387. The cost to rent a private jet from New York City to West Palm Beach starts at $12,000 for light jets; $14,000 for midsize jets; and $18,000 for heavy jets (one-way); round-trips are priced as two separate one-ways. Check out some of the example costs to charter a jet from New York, NY to West Palm Beach, FL. Traveling to South Florida individually or in a small group? There are a handful of light jets capable of making the flight non-stop, assuming weather conditions are favorable. The Citation V, Bravo, and Ultra are popular choices for non-stop flights to PBI carrying up to 4 passengers. If you’re flying solo or with one additional passenger, the Hawker 400XP can make the journey non-stop, although bad weather may reduce range and result in a fuel stop. Or, you can choose a super light jet like the Phenom 300 or the Learjet 75 for a little more cost, and a lot more jet. Considered the best aircraft choice for flights between Teterboro to PBI, midsize jets can comfortably carry up to 8 passengers non-stop, reaching South Florida in just under 3 hours. The Hawker 800XP is the most popular midsize jet for flight to PBI from NY, offering 48 cubic feet of storage space for up to 8 small bags, or 6 large suitcases, or 4 small bags and 4 golf sets. The Citation Excel is another popular choice, featuring comfortable seating configurations with divans, sofas, and fold-out hideaway tables to relax or stay productive. Wide-cabin heavy jets are the perfect solution for traveling with groups of up to 16 passengers. In addition to offering a higher seating capacity, heavy jets also allow you to carry more luggage, including golf clubs, artwork, and other large items. They’re also ideal for pet friendly charter flights, offering more room for (insert your pet’s name here) to enjoy his or her fur-st class flight. Popular heavy jets for this route include the Challenger 601, with seating for up to 12 executives; the Falcon 2000, featuring an exceptionally quiet cabin and comfort for up to 10 passengers; and the Gulfstream G4, a mainstay in luxury aviation and one of the most iconic jets in the sky. * Example prices based on previous flights from Teterboro to Palm Beach International (KPBI). Prices may vary based on aircraft, scheduling, fuel prices, re-positioning, and other factors. Additional services including de-icing, catering, additional flight time due to weather or ATC, Wi-Fi usage, and/or ground transportation billed separately. Additional airports are available in NY and FL, and may change your charter cost. When flying private, you’ll avoid the congestion at John F. Kennedy and LaGuardia by departing via Teterboro Airport (KTEB). Once you’re in the sky, which can take as a little as 5—15 minutes, your flight will offer more comfort and privacy than first-class airlines offering routes along the Atlantic. Located on the north or east of Manhattan? Fly closer to home by arranging your charter flight from White Plains, Farmingdale, Islip, and other airports in NY and Long Island. New York’s Metro area is served by 12 airports, however, most of them are international airports, and other major airports with scheduled airline service. The majority of business jets and executive flights use Teterboro Airport in Teterboro, NJ; Westchester County in White Plains, NY; or Republic Airport (FRG) in Farmingdale, NY. 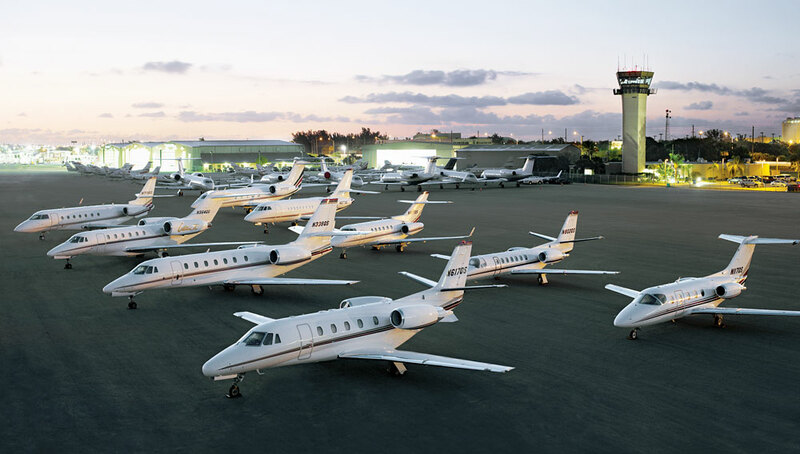 Airlines are prohibited from flying to/from Teterboro due to its runway’s weight limit, allowing the airport and its 6 private terminals (FBOs) to specialize in business jet travel. The Gold and Treasure Coasts of South Florida offer a variety of airport options for private jet charter. Palm Beach International is the most popular choice for luxury and executive flights, with 3 asphalt runways and 3 FBO terminals: Atlantic Aviation, JetAviation, and Signature Flight Support. Additional airports are available in Boca Raton, Vero Beach, Jupiter, Port St. Lucie, and Stuart, allowing you to arrive closer to your office, second home, or beach holidays during the winter months. No matter which airport you fly to or from, you’ll enjoy the same great pay-as-you-fly service with no strings attached. Call us to discuss which airport best suits your flight between New York, NY and West Palm Beach, FL. Whether you’re flying individually in a light business jet to Palm Beach County, chartering a heavy jet to relocate the family to a new home in South Florida, or hiring the most luxurious airliner for group charters and special events, we offer every option for private jet charter West Palm Beach, FL. Private Jets Teterboro instantly connects you to our network of approved operators and air carriers across the country to private aircraft rentals in your area. Our systems give us access to all of the planes available across the country for charter, including empty legs and deadhead jets. Arranging a business jet for your executive team? We can arrange Wyvern Wingman and ARGUS Platinum jets for corporate office travel, and corporate airliners in executive configurations are available for business groups of up to 180 passengers. Our experience in private aviation allows us to offer the most competitive rates on private charter flights without ever sacrificing the safety, quality, or comfort of your flight. Whether you’re looking for a last-minute flight or searching for the best price, call us at (888) 987-5387 for instant pricing and availability on private jet charters from New York, NY to West Palm Beach, FL. Call us at 1-888-987-JETS (5387) and get the best deals on private jet charters to Palm Beach International Airport, along with the highest levels of safety and service in the industry. Enjoy on-demand air charter services, competitive charter rates, and instant access to private jets for your charter flight from New York, NY to West Palm, FL.